Canada will not join a US-led missile defence system, it has announced. Prime Minister Paul Martin said Canada remained the staunchest of US allies, despite deciding to opt out of the ballistic umbrella. The decision, widely predicted, is expected to win popular support. Polls suggest most Canadians oppose the plan. The US said it had taken note of the news. Correspondents say the decision could cool the relationship between the two countries. It follows Canadian criticism of the US-led war in Iraq in 2003. "We respect the right of the United States to defend itself and its people," Mr Martin said on Thursday. "Indeed, we will continue to work in partnership with our southern neighbours in the common defence of North America and on continental security. "However, ballistic missile defence is not where we will concentrate our efforts." The US said it had successfully tested an interceptor missile in the Pacific on Thursday. 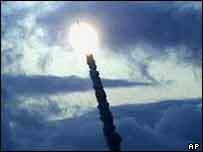 It said in five out of the six trials undertaken so far to shoot down an incoming missile, the technology had worked. Mr Martin had previously backed participation in the programme, and Canada started formal talks earlier this year on its possible participation. But heading a minority government and facing significant opposition to the plan from within his own Liberal party, the prime minister was under intense domestic pressure to shun US advances. In Washington, a State Department official reacted to the news, saying: "We certainly hope that despite the decision we'll still be able to continue our broad range of cooperation on bilateral issues, including on defense cooperation." On Tuesday Ottawa's new ambassador to the US caused an uproar by saying a defence pact the two neighbours signed last year meant Canada was effectively already part of the defence system. Canada agreed in August to allow the joint Canadian-US air defence command to share information with the missile defence programme.